While there are a number of valuable resources that explain the Lean philosophy or focus solely on operations or manufacturing, none provide an integrated, holistic view and the how to needed to address todays relentless and severe pressure to gain or improve a competitive advantage. 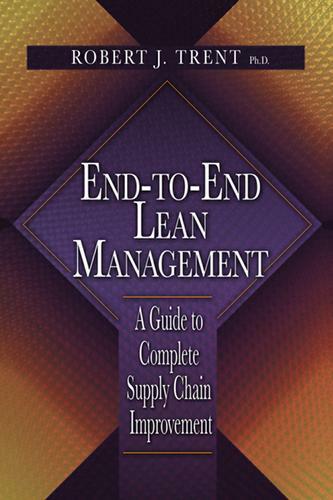 End-to-End Lean Management: A Guide to Complete Supply Chain Improvement fills an important void in the current literature. It shows how to apply Lean tools and techniques across the entire supply chain: from suppliers, through transportation, into operations, and through distribution to customers, with principles applicable to all types of organizations. Managers across all industries under constant pressure to find new sources of competitive advantage and to demonstrate performance improvements will find this book a timely and necessary resource. He has been published extensively in numerous academic and professional journals and magazines and his research is often published by the Center for Advanced Purchasing Studies (CAPS). Dr. Trent is co-author of a best-selling textbook entitled Purchasing and Supply Chain Management, now in its third edition, and author of another outstanding book entitled Strategic Supply Management: Creating the Next Source of Competitive Advantage. He is also a sought-after speaker for seminars, webinars and professional conferences.